Light weight aluminum alloy frame for strength and durability. High impact plastic handle with rubberized grip. Adjusts to 3 cutting angles. This 12-inch heavy-duty hacksaw offers all of the features a professional needs: an industrial-strength square frame, easy tension control, handy blade storage compartment and able to accommodate both 10-inch and 12-inch blades. Designed to adjust for both 45- and 90-degree angles, the 12-inch blade ensures true, efficient cuts under the toughest of conditions. Thoroughly tested and inspected for durability, functionality and product longevity. The 6 inch blade of the HDX Close Quarter Hacksaw Pipe Cutter cleanly cuts pipes to the length you need. Knurled handle for an effective grip. Especially great for cutting in tight spaces. Husky Junior Hacksaw Light weight aluminum alloy frame for strength and durability. 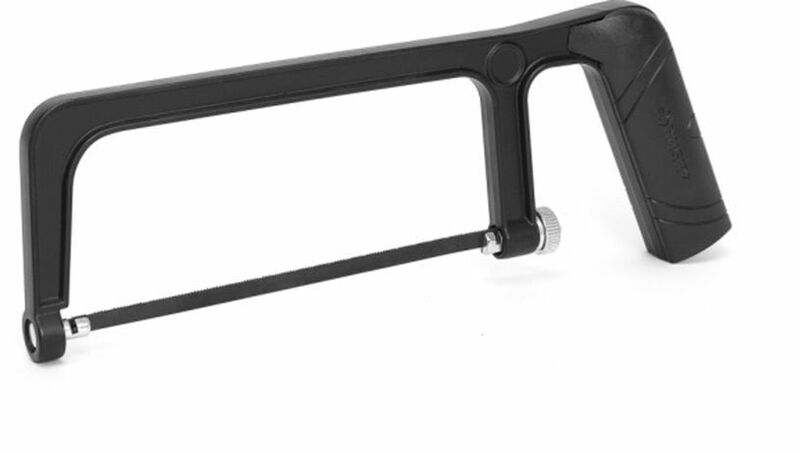 High impact plastic handle with rubberized grip. Adjusts to 3 cutting angles.